I know April Fools is a day to be silly, but I’ve got to tell you that this day has taken on a different, “non-silly” meaning for me. You see, I was, for a while, a student of the great mythologist Joseph Campbell, and he did not see the Fool as somebody being mischievous on an April morning. Oh no. The Fool is a hero. 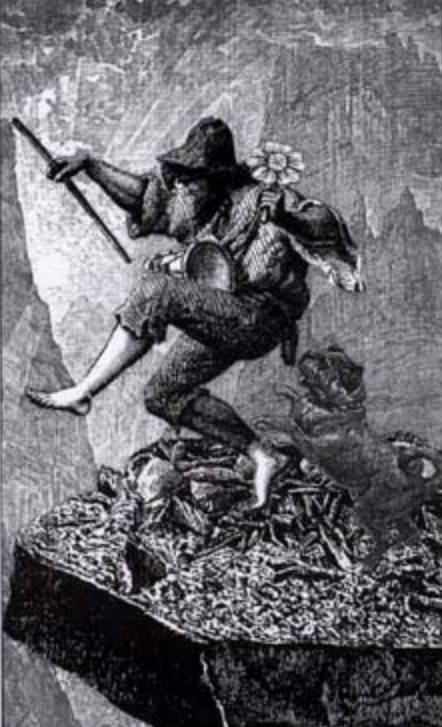 The Fool, Campbell explained, is the character in ancient card decks, the ragged one with a tramp’s sack on a stick over his shoulder, and dogs nipping at his heels. He’s paying no attention to those dogs and he’s about to walk off a cliff. The Fool is a hero because he’s on a mission to save the world and nothing’s going to stop him, not his poverty, not the warnings of the dogs, not the precipice ahead. Fools don’t listen when people say "You can’t do that—it’s too dangerous." Or "You’re too old—or too young, or too powerless." Or "Where’s your degree?" Or a really scary one—"You’re gonna go broke." Fools only listen to their own compassionate instincts, to their own drive to make it all better. So they go right ahead, no matter how sure sensible people are that they should keep their heads down. When Campbell introduced me to the Fool, I realized why the work I do has such a strong grip on me. I’d been calling such people Giraffes because they “stick their necks out” in compassionate service. For the last ten years, finding them and making their stories known has downright consumed me. Giraffes and capital F Fools, I realized—they’re the same. Something in me knew that in this time when so many things need changing, we need our heroes. Not the rich and famous—and trivial – but the ordinary people who hear a call to serve and take the challenge on, no matter what they have to give up or go through. The people who can show us a way to live our lives that is exciting and meaningful. Too many of us are bored. Just plain bored. Nothing’s on the line. There’s no make-or-break challenge in our laps—nobody’s life depending on us. No adrenaline pumping. Each new day is just same old same old. Maybe that’s why so many men remember combat fondly. They may have been scared to death at the time, but what they were doing then mattered. Every move counted and they were bonded to their buddies, committed to seeing each other through the horror. For a lot of men, nothing in the rest of their lives was ever as meaningful, so they get nostalgic about those terrifying days, knowing that peace has been—boring, and that as peaceful citizens they have been less than fully alive. After talking with over 600 people who’ve been named Giraffes for sticking their necks out to serve, I know that peace-time lives—here, where no bombs are dropping—can be full of meaning—and adrenaline. These risk-takers' lives can be almost unbearably exciting. But you have to be a capital F Fool, putting yourself on the line for something you believe in, no matter how many people tell you to be cautious, to look out for number one, to play it safe. Cautious is boring. Self-involvement deadens the soul. And safety is an illusion—being alive is a risky business and capital F Fools are alive. I do like playing tricks on people, and I’ll pull a few on this April Fools. But in my heart, this is All Fools Day, a day to honor the Capital F Fool each of us can be—if we stick our necks out.